Disney has lined up another live-action adaptation of an animated classic as they are working on a new version of Hunchback of Notre Dame. Disney released an animated take on the classic Victor Hugo novel in 1996, which was a reasonably big hit at the time. Lately, the studio has been revisiting their animated library and re-adapting those stories for the modern generation. This time around, they've tapped Josh Gad to produce the movie and possibly to star. According to a new report, playwright David Henry Hwang has been tapped to write the new adaptation, simply titled Hunchback, for Disney. Hwang's credits include Chinglish, Yellow Face, Golden Child, The Dance and the Railroad and M. Butterfly. Though Hwang isn't known for his Hollywood exploits, he is a Tony Award winner and has a very impressive resume. 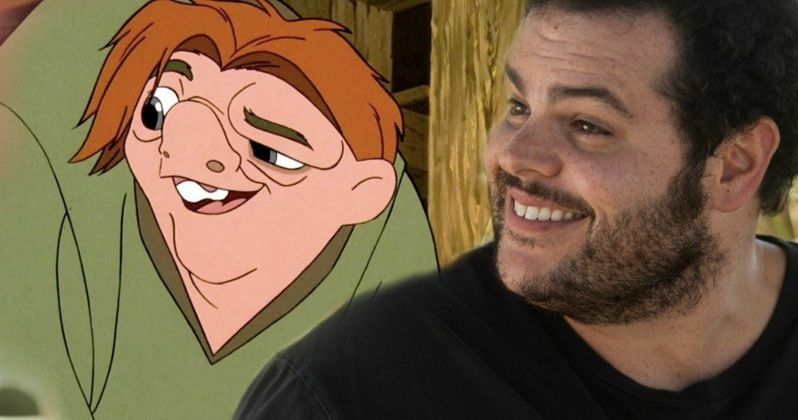 As for Josh Gad, his name has been reportedly floated for the lead role of Quasimodo, but no casting decisions have been made. Gad previously starred in their live-action version of Beauty and the Beast and would seem to be a good fit for the lead. Not just because of his acting ability and look, but he has a great working relationship with the studio, having also worked with them on the mega-hit Frozen. Hunchback will be a musical and the new music will be composed by a pair of legends in Alan Menken and Stephen Schwartz. Menken has composed music for tons of Disney movies in the past, including Beauty and the Beast and Aladdin (both the animated and live-action versions). Menken composed the music for the 1996 version of The Hunchback of Notre Dame and has eight Oscars to his name. Schwartz is also very accomplished, with three Oscars to his name and has collaborated with Menken several times in the past. Some of his credits include Wicked and Pippin. Victor Hugo's 1831 novel centering on Quasimodo has been adapted for the screen several times in the past. In the realm of live-action, the most well-known of these adaptations being the 1939 movie directed by William Dieterle. This particular adaptation will be based on both the 1996 animated The Hunchback of Notre Dame, which was directed by Gary Trousdale and Kirk Wise, and the novel. It will not, however, take anything from the recent European stage version that both Alan Menken and Stephen Schwartz worked on. At the present time, there is no word on who will wind up in the director's chair or how quickly the movie could begin filming, but it does sound like this is in the relatively early stages. Disney is releasing several reimaginings of animated classics this year including Tim Burton's Dumbo (March), Guy Ritchie's Aladdin (May) and Jon Favreau's The Lion King (July). The studio also has Maleficent 2, Mulan. Lilo and Stitch and more coming down the pipeline, in terms of live-action adaptations. We'll be sure to keep you posted as any further details on the project are made available. This news was first reported by Deadline.